The kinetics of an oxidizing of sulfite of sodium by oxygen at the presence of compounds of a cobalt, nickel and iron with monomeric (ammonia) and polymeric (polyethyleneimine) ligands is learnt by kinetic and potentiometric methods and quantitatively depicted. The quantum-chemical calculation of electronic spectrums of dual – CoSO4–PEI and triple – CoSO4–PEI–Na2SO3 systems is held. The matching of calculated and experimental results has shown, that at ССо ~10-2 mole/l in aqueous solution the formation of binuclear structures Co–L–Co is verisimilar. The quantum-chemical calculation of verisimilar intermediate complexes Co, Ni, Fe is held. It is showed, that the reactivity of intermediates is related to weakening of connection О–О in peroxostructures for binuclear complexes (Co, Ni) and superoxostructures for mononuclear complexes (Ni, Fe). The features of oxygen as oxidant are instituted by the large stock of free energy released on reduction reaction O2 + 4? ? 2O2-, and kinetic inertness owing to biradical state and endothermality of the reaction of the joining the first electron confining the opportunity of involving O2 in chemical processes without preliminary activation. O2 has two possible states – triplet and singlet, which are rather close on energy. In triplet (basic) state O; is more stable, as the electrons are on different ¶*l orbitals with parallel spins. The reactions of activated O2 are complicated on spin. The reactions of free O2, going with conservation of a spin, lead to forming radicals. At the co-ordination the degeneration – both ¶-orbitals is taken off and O2 becomes singlet. There are three types of oxygenal complexes: ¶-complex (unstable super-oxocomplex), ¶-?-complex (orbital) and ?-complex (irreversible, strong complex). In the ¶-complexes only ¶-dative transition of electrons is exhibited, in the ¶-?-complexes ¶-dative and ?-donor, in ?-complexes covalent bonds. The widely known fact is the involvement of natural complexes of transition metals with nitrogen containing macro-ligands in oxygen activation. Metal-proteins (myoglobin, hemoglobin), metal porphyrins (cobalt, vanadium, nickel, iron), cupriferous oxygen carrier – hemocyanin and other are referred to them. The activity of natural immobilized of complexes exceeds activity of known catalysts of the reduction of oxygen by sulphur hydride on 6-8 orders. The attempts of modelling of natural compounds on the basis of Schiff bases  have shown that the basic structural and power characteristics of synthetic oxygen carriers depend both on structure of an organic matrix, and on nature of the transition metal, fixed on it. It is revealed, that nitrogen polymer VEMEA-N-VP, polyethyleneimine, and also oxygenated polymer polyacrylic acid are a convenient matrix for fixing of transition metals. The sodium sulphite has been selected as a convenient model for study of the catalytic oxygenation in aqueous solutions. Reaction products allow to assume that Na2SO3 oxidation by oxygen occurs on the intraspheric mechanism because interaction of Co (III), Ni (III) and Fe (III) with Na2SO3 in anaerobic conditions ends with formation of sodium dithionate. where ?i, ?j, ?i, ?j – constants of formation of complexes М3+ and М2+ with a sulphite-ion and polyethyleneimine correspondingly. According to potentiometric data, Na2SO3 introduction in system MX–PEI–H2O leads to sharp reduction of redox potential approximately on 100-300 mV at the expense of reduction of М3+ to М2+. Oxygen absorption simultaneously begins (Figure 1). In the end of experiment when Cso42- ? 0 and Wo2 ? 0 the redox potential of solution МSO4–PEI–H2O leaves for anodic field reaching the reference value. For ammoniates systems the less initial concentration of metal-complex former in a solution, the more return of redox potential to an initial condition delayed. Consecutive addition of portions of sodium sulphite in system MSO4–NH4OH–H2O causes the reduction of the oxygen absorption rate, the activity of the catalyst falls after addition of 10 mole Na2SO3 on mole of the catalyst. Contrary to it at the presence of the polyethyleneimine complexes of the studied metals in an interval рН > 7 in all studied conditions the redox potential of system MSO4PEI–H2O in the end of experiment regularly reverted to the original state. System CoSO4–(PEI)–H2O possesses the maximum stability; after addition of 4.103 mole of Na2SO3 on mole of the catalyst it has not lost the initial activity. Detailed researching of the kinetics of sodium sulphite oxidation by oxygen has shown that in the presence of either complexes of the studied metals fixed on polymer, or ammoniates kinetic behaviour of the studied systems is various depending on the nature of metal, the nature of ligands, of the medium acidities. Typical conversion and potentiometric curves Wo2 = f(Qo2) for the system Co–PEI–Na2SO3–H2O are presented in Figure 1 (a, b). at t = 25oC, kNH3= 4.10 l/mole.min, kPEI = 1.103 l/mol.min. The electronic spectra of the absorbtion of the compounds in visible range (400-800 nm) and in ultraviolet (200-400 nm) are investigated. The studies were carried out, using a spectrophotometer of the firm Jasca, model 78507. 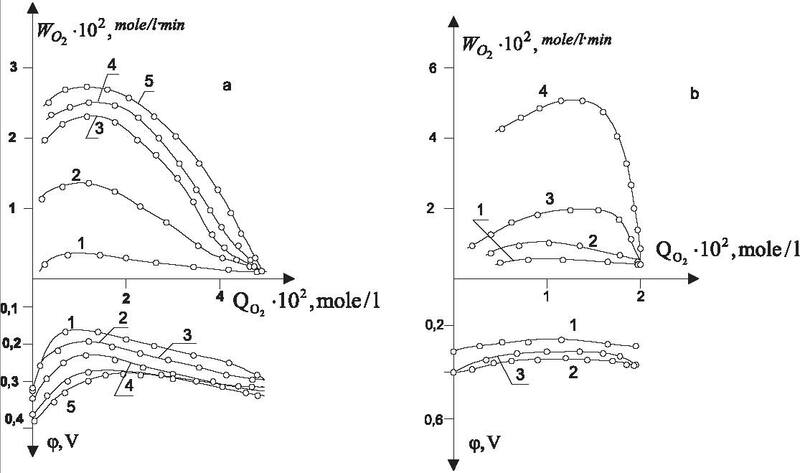 The spectra of aqueous solutions CoSO4 and CoCl2 are investigated at their concentration in aqueous solution equals to 10-2 mole/l. The colour of solutions is pink, that according to the literature data  testifies to formation of octahedral complex compounds [Co(H2O)6]SO4 and Co(H2O)6.2C1. For [Co(H2O)6]SO4 the band with the maximum on 511 nm and the shoulder from the shortwave party is observed at 483 nm. In UV-interval from 225 to 300 nm at the given concentration of salt of cobalt the absorbing is not present. Co(H2O)6.2Cl has similar picture: the band with the maximum 511 nm and shoulder from the shortwave party at 475 nm. Thus we have practically identical absorbing in the case of two cobalt salts (CoSO4 and CoCl2), that undoubtedly points that the absorbing is conditioned by d-d-transferring of cobalt (II) and the dependence from extrasphere ligand is little. Figure 1. The oxidation of the sodium sulphite by oxygen in the presence of Co(II), Ni(II), Fe(II) complexes. At addition solution of polyethyleneimine (CPEI ~ 10-2 mole/l) to the solution CoSO4 (CCoSO4 ~ 10-2 mole/l) decolourization from pink to orange was visually observed, that testifies to reagent interaction and formation of the complexes. A spectrum of the complex is presented with new band with maximum at 450 nm, and the doublet band of d-d-transferrings from the complex Co(H2O)2+6 shifted to the shortwave part of the spectrum, and is observed by the way of well allowed doublet with maximum at 506 nm and 474 nm. On the other hand this doublet is possible to be considered as part of an electronic spectrum of the formed complex Co2+.PEI. At the dilution of the complex (<103 mole/l) the band with a maximum is observed at 232 nm in UV-range, and the band d-d-transferrings of the cobalt has come back in the initial position, characteristic for Co(H2O)2+6 and is observed on length 503 nm with a shoulder at 486 nm. However, from the literature  it is known, that the complex PEI–Co2+ has characteristic band of absorbing at 313 nm. Thus above described variations in electronic spectra of system PEI–Co2+ can be interpreted so: at strong watering there is a breaking down of the complex PEI–Co2+, and the band 232 nm belongs to –NH+2 groups PEI. As it was found out, the reason of breaking down of the complex is connected with using distilled water appeared to be acidic with pH = 5.0. In  it is indicated, that the complex PEI–Co2+ is reshaped at pH > 5 and is stable at large pH. Accounting it, the distilled water with pH = 7,1 was prepared. And the dilution of a source complex PEI–Co2+ at CCo < 103 was without breaking down of the complex, it was characterized by absorption bands at 230 nm and 312 nm, and also very weak bands d-d-transferrings. It has doublet at 507 nm and 472 nm. At addition the solution Na2SO3 to the solution of the complex PEI–Co2+ there is a variation of electronic spectrum of PEI–Co2+. There is a band with maximum at 478 nm, which, apparently, covers weak band of d-d-transferrings. The strong absorption is lower 450 nm is conditioned by a very intensive band with maximum at 225-230 nm. This spectrum is conditioned by formation of complexes in triple system Co2+–PEI–SO2-3 . Thus experimentally in electronic absorption spectra at CCo2+~10-3 mole/l an intensive (230 nm and 312 nm) and two very weak (507 nm and 472 nm) absorption bands are found out. At CCo2+>10-2 mole/l the spectrum is introduced by a new band 450 nm and doublet of the bands at 506 and 474 nm. In the ternary system COSO4–PEI–Na2SO3 the intensity of bands 230 nm and 313 nm sharply rises, thus there is one additional band 285 nm. Calculation of electronic absorption spectra of blankets of solvent molecules of following complexes (I-III) is held by Semiempirical method ZINDO/S  (Figure 2). The dimensional constitution is established as a result of optimization of the geometry by method ZINDO/1 . The calculations have shown that at the coordination of cobalt ion of by four nitrogen atoms (complexes la, b) the formation of several structures with various position of the cobalt ion inside polymeric semiring is possible. The optimized lengths of coordinate linkages for complexes I-III (Table 2) are in the good consent with the data of X-ray structural analysis . Calculation of electronic spectra and optimization of geometry are conducted with the help of a package HyperChem, Release 4.0 for Windows (HyperCube Inc., 1994). As is clear from the table, in system (a1) the band ~230 nm it is possible to interpret as transferring with carrying of charge in the complexes such as la, b. Apparently, it is possible to attribute the bands ~486 nm and ~509 nm to high-spin transferring 4Tlg(d) ? 4Tlg. (d) in the complex Co(H2O)2+6 . In the system (a2) the bands ~230 nm and ~313 nm can be attributed to transferrings with carrying of charge in the complex IIa. The influence of the polymeric chain was modelled by the introducing of the substitute R=CH2–CH–NH2. The atoms of nitrogen are fixed in the trans-position in relation to N5 and N6, as the not valent interactions, arising in trans-fragments, can influence on donor activity of nitrogen atoms. The coordination of the secondary atoms of nitrogen replaced by process of protonisation (structure lie), shifts the band ~330 nm in field ~380 nm, the proportion of the intensity varies also, in this complex in field ~230 nm weak d-d transferring is located. The comparison of calculated and experimental data testifies that at the given concentration of cobalt ions (CCo2+ >10-2mole/l) in the aqueous solution of a binary system COSO4 + PEI the formation of the structure such as IIb is the most probable. Apparently, in the polymeric chains binuclear complexes are formed through one not coordinated atom of nitrogen. Thus, the quantum-chemical analysis of spectrophotometric data of the binary system COSO4–PEI demonstrates that the increasing of concentration of cobalt ions results to the conformation variations of polymeric complex, increasing of positive charge of the system transfers compact conformation of the chain to the unwrapped. The structure such as IIa forming constructs an opportunity of passing of the oxygenation reaction on binuclear scheme. At addition of Na2SO3 in the solution the sulphite-ion forces out water molecules from coordination sphere, and it results to formation of complexes IIIa-d (Figure 2). The calculations have shown that in the presence stronger than water, reducer SO2-3 coordination number of the cobalt ion falls to four. The formation of strong hydrogen bond between the uncoordinated atom of oxygen SO2-3 group and hydrogen atom of the water molecule introduces the basic variation to electronic structure of the complex. The comparison of calculated and experimental energies of transferrings for complexes IIIb-d demonstrates proximity of these values. As it is visible from the Table 1 different energy values of hydrogen bond or involvement in coordination of hydroxonium ion cause small energy scattering in the field of ~230 nm and ~313 nm. Thus, the quantum-chemical interpretation of the photometric data confirms made from kinetics (equation (2)) deduction about the opportunity of passing of oxygenation reaction on conjoint binuclear mechanism. 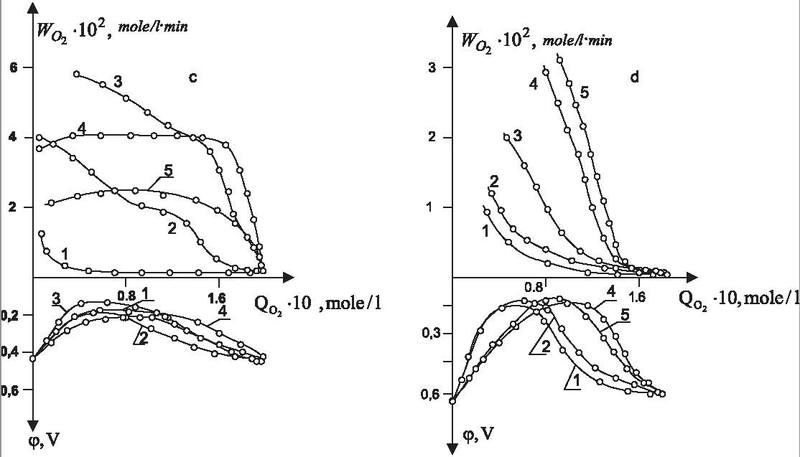 The kinetic data testify that such structure of transitive state provides optimal conditions for oxidizing reaction SO2-3 to SO2-4 At the variation of CPEI in an interval from 0 to 10-2 mole/l function Wo2=f(CPEI) passes through maximum corresponding CCo2+= CPEI=1. Further CPEI increasing has negative effect for reaction rate. Apparently, the SO2-3 displacement from coordination sphere by nitrogen atoms of amine group results to deceleration of oxidation process. Figure 2. Possible intermediate complexes in the reaction (1). The calculations are held with allowance of only the first cover of the solvent molecules. Activation energies of oxygenation reaction on cobalt-ammine compounds are calculated by method EMH. Spacing interval between ions of metal and molecule of oxygen is chosen as coordinate of reaction. In transitive oxygenated complex rM.0=1,86A corresponds to the data of X-ray structural analysis for oxygenated complex of cobalt. The calculations have shown, that at substitution of the hydrogen atoms on an ethylenic fragment the transfer of charge on cobalt ions sharply rises, and the activation energy of oxygenation process is decreased to ~16 kkal per mol. Probably, the more transferring of charge on ions of metal, the more easier it is to carry out dative carrying of electronic gravity on oxygen atoms. * Constant of SO32- protonation in internal sphere of a complex. Catalytical solution developed on the basis of the cobalt complexes fixed on polyethyleneimine, allowing to clear 4.103 mole of Na2SO3 or SO2 on mole of the catalyst without activity loss. The received catalysts possess high catalytical activity (>10000 hour-1). The offered catalyst has passed laboratory test on pilot installation with productivity 2 m3/hour (on gas), and also is tested on TPP-2 of Almaty in the process of smoke gases clearing from sulphur compounds on installation with productivity 180m3/hour. It was possible to lower content of SO2 on 90-92 %, NOx – on 80-83 %, CO – on 80-82 % and to carry purification of gases to sanitary norms. Detailed researching of reaction kinetics of sodium sulphite oxidation by oxygen in the presence of the nickel complexes fixed on polymer has shown that in the limiting act participates either mononuclear or binuclear metal complex depending on the nature of metal, the ligand nature, conditions of reaction execution. Thence regularities, and consequently, and the kinetic equations describing they are different. Formation and participation in the limiting act both mononuclear and binuclear compounds is characteristic for nickel complexes while binuclear complexes operate in all studied interval of components concentration for compounds of Co, and in the case of iron complexes using are present and participate in work mononuclear complexes only. The founded properties are characteristic for monomeric (ammoniate) ligands, as well as polymeric macroligands. Constants of complexes formation and a constant of the reaction rate with participation of mononuclear and binuclear complexes of cobalt, nickel, and iron both for monomeric and for polymeric ligands are presented in the Table 2. From the results of the table on an example of cobalt complexes it is clearly visible that activity of the cobalt compounds fixed on a polymeric matrix at least on 2-3 order above monomeric analogues, and it is not straight associated with constants of complexes (?, ?, ?) formation though it is necessary to notice, that the increasing of affinity of polymeric complexes to coordination of О2 (?) in comparison with monomeric analogues is observed. This occurrence was marked for variety of complexes of Co, Сu, Ru etc. and can be a consequence of variety of factors: entropic distinctions in durability of metal-oxygen bond, and also in solvating of adduct О2 (gas) – О2 (polymer). For mononuclear complexes of the same composition activity of coordination compounds in reaction (1) accrues in a line: Fe(III) < Ni(III), an activity order of binuclear complexes another: Ni(III) < Co(III). For binuclear cobalt complexes correlation between lgkj and ?0X2 ? 2X characteristic for ligand entering in internal sphere of a complex also besides PEI and SO2-3 is found. The given fact specifies that ligand Х is the bridge in binuclear complex. Protonation of SO2-3 affects negatively at the reaction ability of a complex, formation of HSO3- , SO2 in internal sphere leads to loss of activity in a row: SO2-3 > HSO3- > SO2. Further protonation in binuclear complexes leads to protonation of bridging ligand and to disintegration of complex that is reflected on process kinetics at once. Protonation of oxygen in mononuclear compounds promotes increasing of the rate constant approximately by an order. Calculation of binuclear complexes of simple amines with molecular oxygen (Figure 2 Ia, IIa, IIIa) has been carried out by RMH method for comparison of electronic and energy characteristics of mononuclear and binuclear complexes formed by ions of transitive metals (Co2+, Ni2+), and also for comparison of characteristics of binuclear complexes of the same metal with the various ionic bridges (Cl-, OH-). The calculated structures are transitive states of oxygenation reaction. Within the limits of RMH method search of saddle points on a potential surface is connested to the big mathematical difficulties, therefore modelling of a transitive state (reversible binuclear complexes) was spent on the basis of the analysis of a potential surface and with using of X-ray structural analysis data. Calculations are spent with partial optimisation of geometry. We assume that the calculated structures are close to saddle points. In the Table 3 some geometrical parameters and the energy characteristic of structure stability are resulted. Atoms N4M2Cl1M3N8O20O21 lay practically in one plane, SO2-3 groups are located in a perpendicular plane. The length of bond О–О only was optimised in fragment М2–О20–О21–М3, ?мо was accepted equal 1,86? that corresponds ?СоО, little changes of this bond depending on metal type were disregarded. As it is clear from Tables 3, 4 interatomic distances and occupation density of bonds M–N and М–Х depends not only on metal type, but also on type of the ionic bridge. The ionic bridge changes degree of convertibility of complexes in relation to SO2-3 , the probability of disintegration of bonds О12–М2 and О16–М3 increases at replacement OH- by Cl-. Donor activity of group OH- above than Cl- (population density of bonds М2–Х and М3–Х is more in a case of OH-), therefore binuclear complexes more stable in case when the ionic bridge is formed by OH-. Population of bonds О21–О22 also strongly depends on type of the ionic bridge. Calculations have shown, that in the presence of an ion of Cl- atoms of oxygen О21, О22 give the contribution to higher МО [Co (-12.69), Ni (-10.44)], than in a case of OH- [Co (-12.73), Ni (-13.49)]. Thus, ions Сl- and OH- not only variously coordinate with metal ions, but also differently influence on character of metal coordination with the others ligands. In the calculated row of complexes the greatest negative charges concentrate on atoms of oxygen (Table 5). These atoms become the most probable centres of interaction with ions Н+ in the acidulous environment, therefore there is a probability of formation of structures of type Ib, IIb, IIIb. (Figure 2). Interatomic distances and population of bonds in these complexes testify that in the acidulous environment disintegration of binuclear complex and progress of process of oxygenation on a mononuclear complex (Tables 3, 4) is possible. As is clear from Table 4 protonation process of binuclear complexes of Со2+ leads to appreciable strengthening of bond О21–О22. The charge becomes positive in these structures in process of protonation on atom of oxygen О22 while it remains negative on О21. Process protonation leads to additional delocalization of electronic density along bond О–О that apparently is the reason of its strengthening. In complexes Ni2 + protonation process gives a inverse effect: the negative charge on atoms of oxygen increases, and bonds О–О strongly languish. It is possible to assume that protonation process strengthens donor activity of Ni2+ in relation to О2. It is confirmed also by character of МО filling in complexes IIIa, IIIb. In IIIa it is possible to allocate МО with the essential contribution only atom orbitals of oxygen molecule, and in IIIb these МО are located above and are already mixed, the essential contribution to them bring not only atom orbitals of oxygen, but also d-orbitals of nickel ion. Calculations have shown that in the acidulous environment oxygenation process can proceed both on bi- and on mononuclear complexes, at that it goes better on binuclear structures for complexes Со2+, and it is better on mononuclear for Ni2+. Thus kinetic researches and quantum-chemical calculations have shown that catalytical activity of the studied complexes in the process of sodium sulphite oxidation by oxygen depends on nature of central atom and ligands surrounding it. The process mechanism includes formation of an intermediate mononuclear or binuclear complex and weakening of bond О–О in the limiting act. It is showed, that the basic legitimacies are similar for monomeric (NH3) and polymeric ligands. A composition of intermediate complexes constants of their formation in conditions of process and constant of velocity of redox disintegration on products of reaction in a limiting stage determined by kinetic and spectrophotometric methods. The scheme of the interspheral mechanism of an oxidizing of dioxide of sulfur by oxygen at the presence of learnt fixed catalysts including formation and redox- transubstantiation of an intermediate complex in a limiting stage is proposed. The kinetic equation allowing to adjust and to optimize process is obtained on the basis of the proposed scheme. The catalyst having high activity (> 10000 hours-1) and high stability, allowing to oxidize 4.103 mol Na2SO3 on the mol of catalyst without losses of its activity is obtained on the basis of the held studies. 1. Masters K. Gomogennyi kataliz perekhodnymi metallami. M.: Mir. 1983. 2. Emelyanova V. S., Sarmurzina A. G. // Vestnik KazGU. 1998. P. 27. 3. Bushtein I. F. // Zh.Struct.Khim. 1998. V. 39, P. 25. 4. Romanenko G. V. // Zh.Struct.Khim. 1997. V. 38, P. 930. 5. Lurye U. U. Spravochnik po analiticheskoi khimii. M. 1977. P. 275.